To many people, the thought of ‘royal commemoratives’ conjures up a vision of rows upon rows of ceramic mugs, each bearing a royal crest, or, maybe, a picture of the queen. But it doesn’t have to be like that. I’ve collected royal memorabilia for many years, and go out of my way to seek out the quirky, often slightly disrespectful pieces! I look around for cheaper royal commemoratives too; things like eggcups, keyrings, tins, cards, hankies, scarves, mascots, jigsaw puzzles and cruets. Much of this tends to be referred to as ‘kitsch’ – but let’s face it, part of the fun of any royal or patriotic event is the plethora of bunting, stickers, flags, posters, badges and other colourful items which normally we wouldn’t give house room to. And maybe that is the key, because as nearly all of this stuff is soon discarded, you find that after a few years it starts to become collectable, often worth more than the few pence or pounds you originally paid. These cheap and cheerful collectables are the kind of items which tend to end up in charity shops and boot sales, and might not look much; yet when they are grouped together, maybe in a bookshelf or on a side table, they can make an amusing and eye-catching focal point. 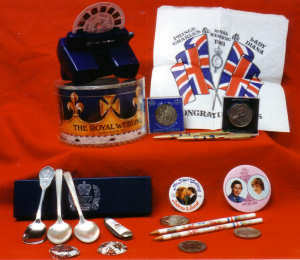 A major royal occasion will spawn all kinds of ephemera, so it’s worth looking out for patriotic paper napkins, tablecloths, plastic hats, programmes, toy windmills, periscopes, chocolate wrappers, souvenir grocery packets and much else. I’ve accumulated foil milk bottle tops from the Investiture of Prince Charles in 1969, paper napkins from the 1977 Queen’s Silver Jubilee, and an interesting thin cardboard box, which originally contained cupcakes, celebrating the Queen’s Golden Jubilee in 2002. This box is printed with a ‘Corgi Racin’ Game’, a colourful design of corgis and a finishing post. The idea was to cut out the corgis, glue them to coins and then flick them along the table to the finish. Almost certainly the majority of these boxes would have been thrown out when the cakes were eaten, so packaging such as this makes an interesting find. Other cheap and cheerful items often discarded after the event include pencils, tins, rulers, badges, notebooks, children’s paint boxes and pens. I have a pretty baby’s bib printed with pictures of Princess Diana and Prince Charles, issued for their 1981 wedding, presumably to prevent tots getting jelly all over their party frocks at the street parties which were held all over Britain on the big day. Also in my collection is a super 1980s’ stand-up cardboard Sarah Ferguson, with a note pad attached. She is drawn as a caricature, dressed in a ski suit and sporting a ‘hello, sailor’ badge as a reference to Prince Andrew. Another unusual piece is a royal family set of wooden stacking dolls I snapped up recently at a bootsale for £5. This super piece shows the Queen, while nestling inside is Charles, inside him is Diana, inside her is Fergie, who contains a tiny Andrew. One of my favourite royal commemoratives is quite recent, making its appearance last year. It’s a set of ‘wind-up royals’. 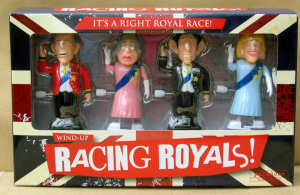 Made by Paladone, the box contains four clockwork characters – the Queen, Price Phillip, Prince Charles and Camilla – and the idea is just to wind them up and see who moves the fastest. They stomp along, regally waving to us lesser mortals as they go, and the first one to reach the finishing line gets to rule the country! With character faces and colourful costumes, this hilarious, colourful plastic set of royal people is worth every penny of the £10 or so which they cost, and they are available from various gift and novelty shops. Commemorative headscarves and handkerchiefs can be bought cheaply, and these are frequently very attractive, bearing pictures of the royal coach, the processional route, soldiers and members of the royal family. Usually they are found unused as they would have been intended as souvenirs rather than functional items, which is just as well, because many fabric items used non-fast colour dyes. Don’t wash them unless it is really necessary, especially if they are silk, or you might end up with a crumpled, sorry-looking object in which all of the colours have run. I’ve often seen these scarves and hankies, still in pristine condition, for £10 or under. Mascots are sometimes sold for royal occasions. At one time they consisted of small celluloid dolls, dressed in red, white and blue ribbons, which could be pinned to a coat or a dress. Nowadays, mascots are more likely to be small red, white & blue teddy bears or character animals. Other slightly more permanent souvenirs include jigsaw puzzles and moneyboxes. Small metal crown-shaped moneyboxes appeared in 1953 to commemorate the coronation, and various tinplate pillar-box shaped types crop up from time to time, including one issued for the 1937 coronation of George VI. Jigsaw puzzles are always colourful; amongst my collection are some very attractive coronation versions, including one made from wood which shows a complete map of the coronation route, from Buckingham Palace to Westminster Abbey. Don’t forget tins, some of the royal related ones are stunning, and apart from the usual tea caddies and biscuit tins, smaller tins can be found which contained peppermints, chocolate or other sweets, Years ago, my parents gave me the thermos flask they bought to celebrate the 1953 coronation. Made from bronze-coloured metal, it is printed with a portrait of the Queen, as well as a sketch of the royal coach in a procession. These flasks can still be found today for well under our shoestring limit, and it’s fun to imagine the tourists sipping tea from their royal flasks as they lined the processional route, waiting for the newly-crowned Queen to emerge form the abbey. Over the years Viewmaster handheld 3D screens have appeared with hundreds of different film reels and the company have often produced commemorative reels for royal occasions. In 1981 they issued a royal blue viewer which was fitted with reels containing images from the wedding of Prince Charles to Princess Diana. These are now creeping up in price, but with a bit of luck should still be obtainable for our £20 limit. 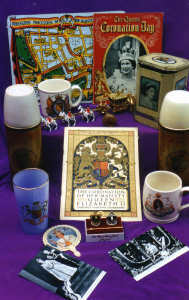 Many collectors of royal memorabilia like to augment their displays with suitable diecast toys, especially models of the coronation coach, or of other royal carriages. Although some of these can change hands for vast amounts, plenty are available for much less, and they look good amidst a group of ceramic items. Other diecast miniatures, such as buses, cars or vans emblazoned with royal insignia, will bring a collection alive, too. 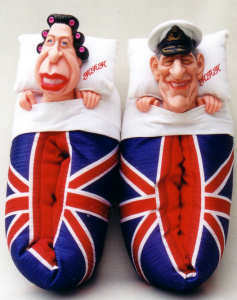 The Spitting Image team of Fluck and Law were responsible for many royal caricature items, notably an extraordinary pair of union Jack slippers embellished with plastic heads of the Queen and Prince Phillip. Also seen are keyrings bearing character heads of royals, and large masks. I am the proud owner of a large rubber head of Prince Charles! 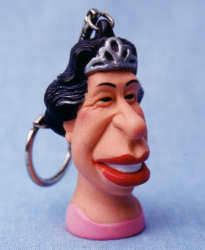 Many Spitting Image influenced items can be found for below our budget. More sought after are a series of 1980s’ white ceramic egg cups shaped as heads of the royal family, amongst them the Queen, Prince Phillip, Princess Diana and others. These are great fun, and they also included some more unusual characters such as a very young Princess Eugenie. If you could assemble a set, they would look most attractive displayed against a dark background. The modelling on these white egg cups, though rather disrespectful, is extremely fine. This brings us to the other ceramic items, and as I said at the start, they needn’t be boring. There is a lot of fun stuff out there if you keep your eyes peeled. Perhaps the best known is the Prince Charles ‘Big Ears’ mug, which was designed by cartoonist Marc Boxer at the time of the royal wedding. One ear forms the handle. Admittedly, these mugs are often above our budget, but a rummage at a boot fair or collector’s centre can sometimes turn them up around the £20 mark. Other fun items include the Carlton kneeling cups, which have legs attached with one knee bent reverently, and a mug by an unknown company showing a cartoon of Princess Diana dancing the can-can while Prince Charles is dressed as a punk rocker! I have another mug showing Sarah Ferguson gleefully riding a bright yellow helicopter, with Prince Andrew riding off in the opposite direction; needless to say, the mug was produced at the time of their divorce. My own special favourites are various mugs issued by the Daily Mirror decorated with drawings of corgis. The mugs are pink, and on the one made for the Queen’s 60th birthday in 1986, corgis – instead of the more usual lions – pose against a shield bearing a large 60 while the motto below reads, ‘Happy Birthday, Ma’am’. The reverse shows the dogs posing regally with a message, ‘Greetings to Her Majesty from the Royal wags’. Another pink Daily Mirror mug, this time commemorating the wedding of Prince Andrew to Fergie, shows the back view of the royal couple, dressed in full wedding regalia, with the corgis acting as bridesmaids. There are plenty of other slightly quirky ceramics out there, as well as the more familiar mugs decorated with royal portraits and crests. Other easily-found shoestring ceramic items are thimbles. A comprehensive collection of royal thimbles could quickly be formed at our shoestring prices, and takes up very little room. So, if you want to proclaim your Britishness – and why shouldn’t we be proud of our heritage – then royal paraphernalia makes a good budget collectable. However, it might be wise to start collecting now, because if a royal event does soon take place, (rumours of a wedding are gathering momentum), it will revitalise the royal memorabilia market, creating a huge interest in royal items from all reigns. If that happens, many of the items described here could soar above our shoestring budget!